Workshops were recently held in Georgia. He described how he was working with his officers on the five-yard line while the other department was working farther back on their range, near the 25-yard line. He could hear the metal target in the next range ring every time a bullet hit it. Their post-accident investigation discovered that one of the bullets hitting the metal target caused a sharp jagged piece of metal to break off from the target, fly up and over the earth berm, striking one of his officers in the neck. His officer, an Army veteran, immediately dropped to the ground and began applying direct pressure. The metal shrapnel missed his jugular vein by fractions of an inch, and he survived. New Georgia TSOs try on their vests. 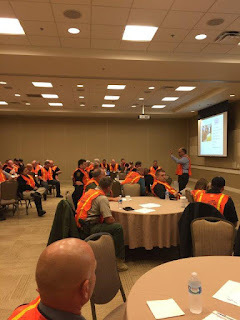 The Georgia Local Government Risk Management Services (LGRMS) sponsored the TSO workshops during the last week of October. The classes were filled with deputies and officers from the cities and counties that make up the LGRMS membership. The workshops concluded with the officers presenting safety briefings to the entire class, and they “got it”. I thank LGRMS staff and particularly Dennis Watts and Natalie Sellers for the opportunity to work with their deputies and officers. Their level of engagement and their willingness to open up and embrace a new program was impressive. And, by the end of the last workshop, they had convinced me that I was one with the accent. Up Next: More Dividends for Members! Those three lines: “I never thought it would happen to me, it happened so fast, and I wish I could do it over” were woven throughout a presentation by Brian Devlin. Mr. Devlin is a physical therapist and a vice president for Illinois Risk Management Services. 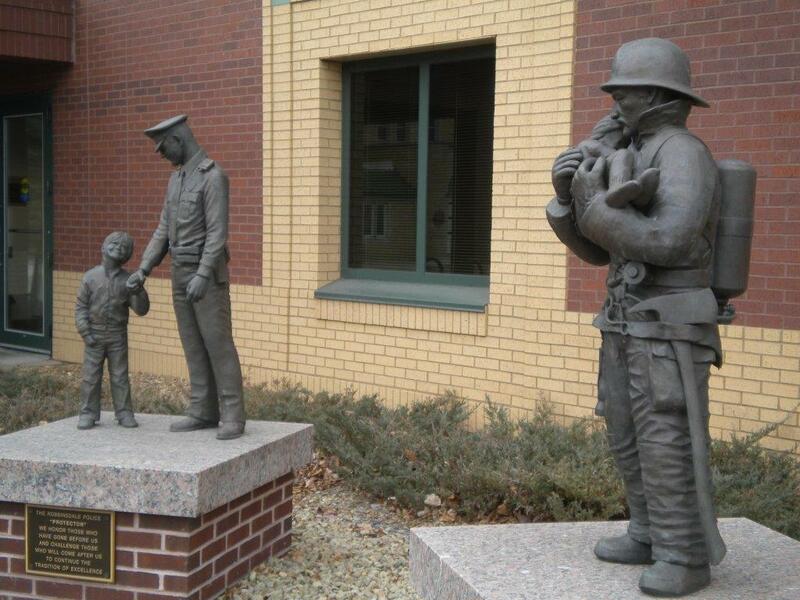 He has worked with hundreds of public safety employees who have been injured on the job. “They all say it,” he said as he reflected on his patients speaking about what has happened to them. Why? “It happened so fast” may be the post-accident realization that when things start to go wrong, they can go wrong at a speed that cannot be reversed. There was no time to react or escape. Was it a loss of situational awareness? Or has this happened before, only more slowly—perhaps it was a near miss, and no one got hurt? “I wish I could do it over” has a ring of sadness to it. It may be the realization that the accident has changed things forever, and they can’t go back. Injuries change people physically, personally, and professionally. They change organizations as well, and you can’t go back. Up Next: The Training Safety Officer Program goes to Georgia. Police station lobbies are interesting places: often they are occupied by people under stress due to a traffic ticket, an impounded car, or a jailed relative. When you add in worried parents, scared victims, insurance adjusters, families with custody disputes, and lawyers, then you have more anxiety than most reality TV shows. 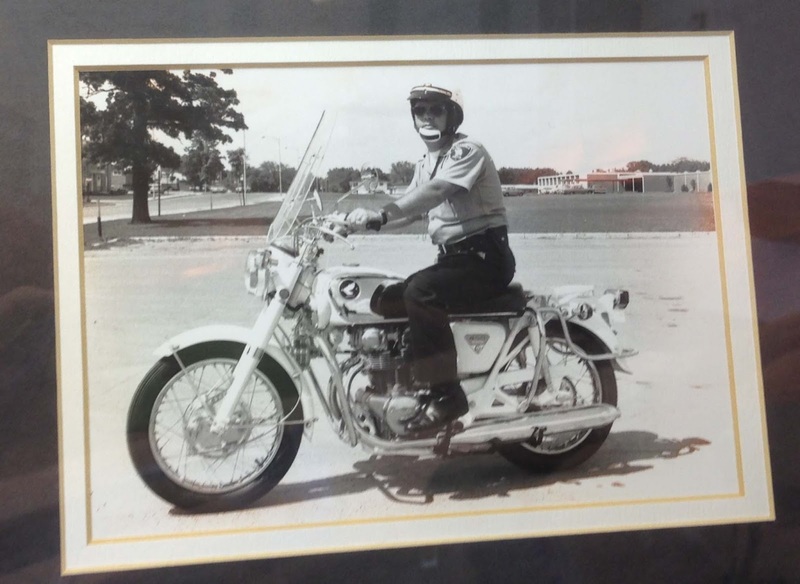 Many departments try to soften their station lobbies with old photos, or equipment that tell the history of the department and show a human side to police work. 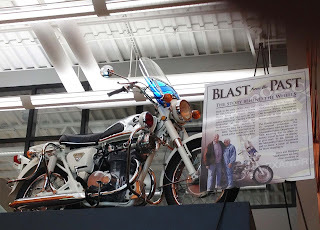 The motorcycle, along with its story, tower over the lobby. 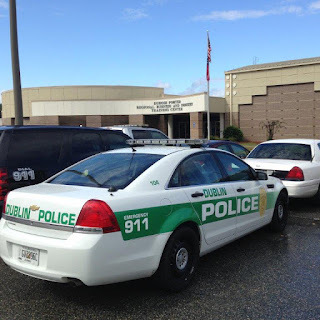 The Alexandria police station has all of that, plus a motorcycle in their lobby. Or perhaps over their lobby would be a better description. The story board next to it provides the background with its large font heading of “Blast From The Past: The Story Behind The Wheels”. The cycle is a cream-white, mid 1970’s Honda 450 in absolutely perfect condition. It has the classic 1970’s design, and is complete with red lights, a mechanical siren, and the ability to bring a smile to people’s faces. In the mid 1970’s, Alexandria residents Jerry and Margaret VanKampen brought the motorcycle back from a Honda trade show in Japan. The VanKampen’s owned the local Honda dealership and leased the motorcycle to the department. It was mostly used for parades and funeral escorts, and it became a fixture of the community—so much so that the city eventually bought the motorcycle and designed a special spot when they built a new station in 2011. Alexandria has done a nice job of putting their history on display in their station lobby. There are photos of the former police chiefs, as well as an assortment of old photos and equipment. And they have that beautiful cream-white motorcycle that towers over the lobby and makes people smile. Up Next: I can’t believe it happened. It happened fast. I wish I could do it over.